Have you ever felt and been extremely bothered by the grease that can accumulate on your face? Those oils that you know no one cares about yet you become more and more self-conscious the more you think about it. It’s uncomfortable, trust me, we’ve all been there. The constant barrage of thoughts like, “is my face too shiny?” or “I wonder if they’ve noticed.” flying through your head can become maddening. However, there is a solution. Face steamers. These life-saving products are made to open your pores and allow you to truly get the fresh and cleaned feeling you so desire. The advantages of using a face steamer and the lack of negatives make them an eventually irreplaceable part of your daily routine. For those of us who use masks, moisturizers, scrubs- the face steamer will improve their performance. By allowing the pores to open you are adding helpful substances directly to the core of any problem issues such as acne or dry skin. If you use a moisturizer on your skin, I guarantee you will never go back after using a face steamer. The face steamer works as a humidifier and while it’s working on opening your pores the warm mist will be sure to hydrate your skin and bring some life back to that dry, flaky area you’ve been trying to get rid of. Even for those that are unsure, a face steamer is a product that is worth taking the risk that you won’t like it. The benefits are innumerable! Coming in at the top of the list is the Pure Daily Care NanoSteamer. 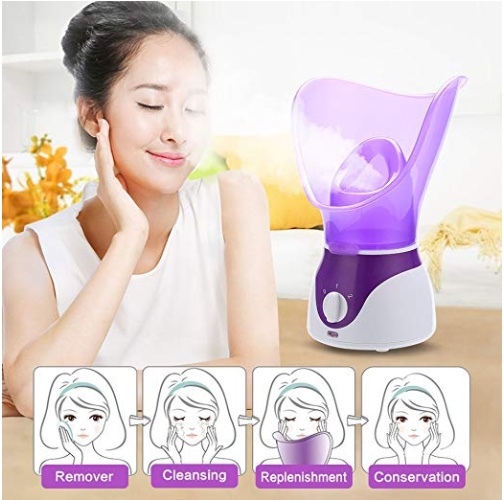 This particular face steamer is actually a 3 in 1 product that also has the added functions of humidifying a room and an extra chamber in which to warm up towels for the optimum relaxation. This product comes with itself and a bonus 5 piece skin kit for any blemish or blackhead removal. The kit is a surgical grade stainless steel extractor kit for blackheads and other various blemishes. So, while you’re getting your steam on, you can be sure to reach that perfect skin level with this generous add-on. The NanoSteamer has a long life span meaning that you don’t need to fill the water chamber again and again, instead, you get 30 minutes of steam all while staying completely silent. There are several benefits of this product but the main one I’ll mention is the change in complexion. Your skin will be healthier and that means you will look and feel younger! Treat yourself and get this face steamer, you deserve it. Pure Daily Care really outdid themselves with this one. I know what you’re thinking- “isn’t this the same item we saw earlier in the list?”. The answer to that is a hard no. This face steamer is a 4 in 1 dreamboat of a product and completely different from the original NanoSteamer! 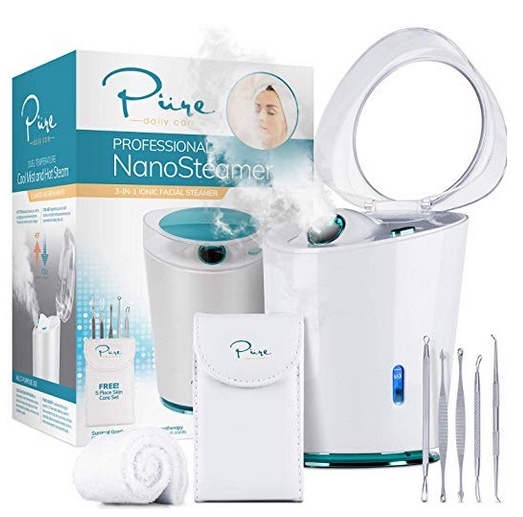 In addition to its sleek design, the NanoSteamer Pro offers and produces 3 times the amount of steam that the original NanoSteamer produced and it has a brand new water tank so that you can relax longer and walk away even more satisfied. Who knew that was possible? This item comes with the 5 piece surgical grade stainless steal extractor kit as well but now also includes 2 new features. The first is another chamber entirely. This chamber is dedicated exclusively for aromatherapy. Aromatherapy is the next big thing for beauty connoisseurs as it is relaxing and provides many health benefits. This NanoSteamer also includes a 3 times magnification mirror so you can see every little detail. If you’re looking for a face steamer that does it all, you’ve found it! This next facial steamer penetrates deeper than many so that blood circulation will increase and so that all of those cells in your face can maintain their healthy and youthful glow. This nano-ionic steamer is multifunctional as it provides many benefits all stuffed inside one product. For those with dry skin, it adds plenty of moisture and leaves your skin feeling refreshed. For the individuals suffering from uncontrollable acne and blackheads, the mist will help manage your breakouts naturally with its deep penetration. Then there are the people with sinus issues, those awful times when you can’t breathe correctly all due to some allergies or other reasons. This product will help clear that congestion using the steam and before you know it, you’ll be returning to normal lung functions! On top of all of this, it’s relaxing. There’s nothing like coming home after a long, hard day and losing yourself in blissful hydration. This product also comes with a set of extraction tools and a hairband to help aid you in all of your steaming adventures! With such a great deal, it’s hard to turn it down. 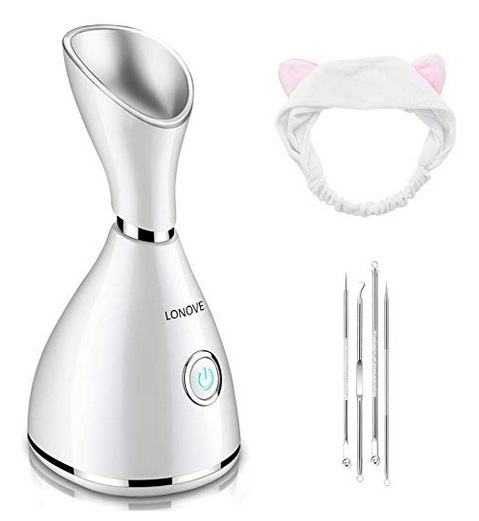 The Zenpy ionic facial steamer takes the typical steaming element of a regular facial steamer and combines it with an ultra sonic vaporizer to produce a very targeted steam called nano steam that contains negatively charged ionic particles. What this means is that the nano steam is much more effective in penetrating your skin and really opening those pores. If you have a stuffy nose or some horrible congestion, send it away with the flick of a switch when you turn on your facial steamer and begin inhaling those soothing fumes. Your skin will be dry no longer with this facial steamer, suffice to say. The mist is finely sprayed directly onto your face in a way that will provide maximum coverage and your face will always be hydrated and feeling fresh at the end. This innovative set claims to have a mist that is 4000x finer than the competition which will allow for more skin penetration and washing away of any blemishes or makeup. If you’re looking for a face steamer with a refined touch, choose this wonderful machine! Whenever you’re looking for a new facial steamer, the choice can be difficult. However, with this choice you have to make won’t be nearly as hard. 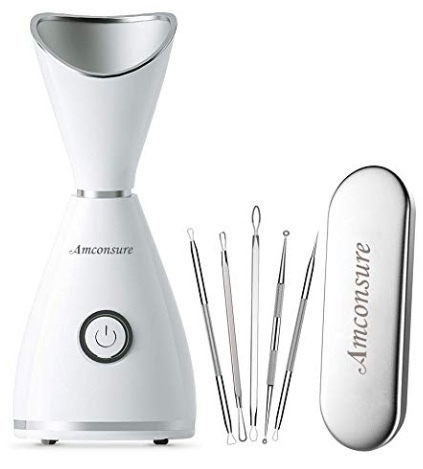 This facial steamer by Amconsure is a multi-functional, professional machine that will help dry skin, acne breakouts, and more. With deep penetration, this facial steamer can wash away the blemishes on your face, cut through resting dirt, and even wash away the stress of the day with its relaxing, warm mist that is sure to hydrate and refresh your skin. Some other great effects of this facial steamer is the fact that it will clear away any congestion you may have and promote blood circulation which can decrease the visual signs of aging. This steamer is very powerful and can remove your makeup with its intense yet soothing spray of mist if you forget one day or you’re just feeling like you’d rather let the steamer do it. This steamer will make a great product to treat yourself with or it makes for a great gift to give to those special friends and family in your life. Either way, you can’t go wrong with this product. This facial steamer is versatile, fun, and functional. With adjustable steam levels and a high quality aluminum vaporizer pot, you’ll never walk away thinking, “man, I wish my facial steamer did more.”. This facial steamer will open all of your pores fully within 8-10 minutes so that you may begin your facial care regimen with the peace of mind knowing that your efforts are worth it. There’s no need to work your moisturizer in this time, you’ll find that the mist hydrates you well enough. With this product you will have a humidifier function for those days where you’re so stuffed up that you can’t breathe through your nose to save your life. There is also another great function with this item- an aromatherapy function. You can insert your favorite essential oil into a chamber and from there you can bask in the relaxing fumes of your choice as the air and mist around you fills with your chosen scent. If you’re looking for that perfect product that combines functionality with pleasure, this is a great product to invest in with its diverse operations. So, looking over this list we see a lot of products that hold their own charms but they can be very similar to one another. This is not the case with the Kingsteam extendable facial steamer. This facial steamer comes with a unique extendable arm that rests on hinge which allows for 360 degree coverage no matter which way you turn it. You can now hydrate your skin while laying down or lounging nearby with your phone, the coverage allows for this. Also included is an ozone steamer. This is achieved using a high intensity UV light that sterilizes the steam so that when it lands on your skin, it is achieving its maximum potential. This steamer also allows for essential oil use for those days where you just need to take the edge off and lay back and enjoy. Whether you’re using eucalyptus or lavender, the scent will surround you and settle pleasantly which leads to a very positive experience. Whether you’re gifting or buying, this steamer is a great choice for anyone looking for a good time. Perhaps one of America’s best selling facial steamer and humidifier- this ionic Steamer with many different modes from Amconsure is another knockout product from a well renowned company. A giant in facial steamers, Amconsure is known for cranking out the facial steamers with a variety of options. This one in particular is one that generates nano-ionic steam by combining a typical heating element with a new ultra sonic vaporizer. This combination produces a steam so fine that it is sure to penetrate even the smallest of pores. It is boasted to charge water particles just strong enough to where it is 10x more effective than leading competitors when it comes to deep, lasting penetration. This steamer comes with a bonus skin set which will aid you in removing those stubborn blackheads and blemishes. The chambers in this unit are made for several different things - it can produce your mist, it can humidify a room, and it can heat up towels so that you that when you go to use it and press it against your skin you feel like you’re living in the lap of luxury. With a spectacularly long running time, this item is a great choice for anyone in the market for a facial steamer. Another fantastic sauna styled facial steamer! This is great for anyone looking for a penetration deep enough to rid the skin of any dirt and makeup that may be left, remnants of the day. This product is a multi-functional king with a deep penetration mist, a warm spray of water that prevents signs of aging, and a humidifying effect that can humidify an entire room. With its quick warm up, all within a minute, you can reach your peak relaxation point faster and truly enjoy this product. An additional perk about the fast heat up is that you’ll have fully powered steam quicker to receive as much mist as possible and therefore the most effect possible. This facial steamer has been tested for safety and quality and the mist it produced is guaranteed to be safe for both your skin and your sense of smell. 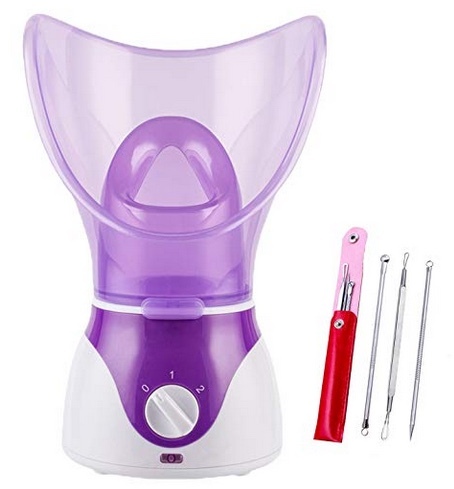 This product makes a great gift as it comes with not only the state of the art facial steamer, but also a several piece surgical extractor kit to help you remove those blackheads and blemishes efficiently yet gently. It also comes with a hairband so that you can hold your hair back while you enjoy the calming mist. It’s a steal!